Every primary school needs this brightly coloured map of the world's countries. Uncluttered with unnecessary detail, this is a great visual aid for kids to learn geography and advance their understanding of the world. 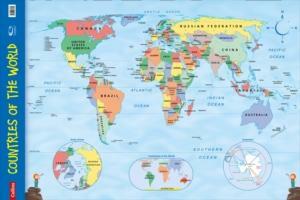 The map is clearly labelled with country names and oceans making it ideal for teaching the location of places.